Breeding macaws isn't easy. First, you have to make sure you've got a breeding pair, as the male and female look much the same. While your vet can confirm the genders, the pair must also bond and truly like each other. If that occurs, a well-selected pair breeds easily. The female needs a nest box in order to lay her eggs and then raise the hatchlings. Make sure the wood chosen for your macaw's nest box is pesticide- and toxin-free. It must also be strong -- macaws are champion chewers. 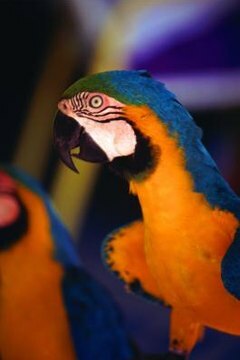 Your macaw's nest box must be at least three times her body length high and one length deep and wide. Place a top on the box. In the front of the box, create a hole just large enough for one grown macaw to enter. Install the box in a high corner of the aviary or cage. The interior of the nest box should include softer woods suitable for chewing, along with hard wood blocks to enable the bird to easily exit the nest. Line the nest box with an ample amount of pine shavings for egg protection.